This year recruiting process just started at prestigious Colegium Artes Liberales faculty at Warsaw University. Direktpoint prepares a campaign promoting Artes Liberales amongst young people. The agency has designed and launched two alternative landing pages for candidates for level I studies and candidates for level II studies. The pages were available at the main website. Develop a campaign promoting a esteemed Colegium Artes Liberales faculty at Warsaw University amongst future students. The objective was to reach out to the largest possible number of students and people interested in studying at that faculty. The additional task was to show the growing importance of the faculty graduates on the job market. On the landing pages candidates could find the ”Greeting package” order forms which they could download in the form of a PDF documentor have it mailed to their home address. Two „Greeting packages” providing information on Artes Liberales faculty and including lists of students, graduates and professors, have been created for the students to decide whether such educational path was right for them. 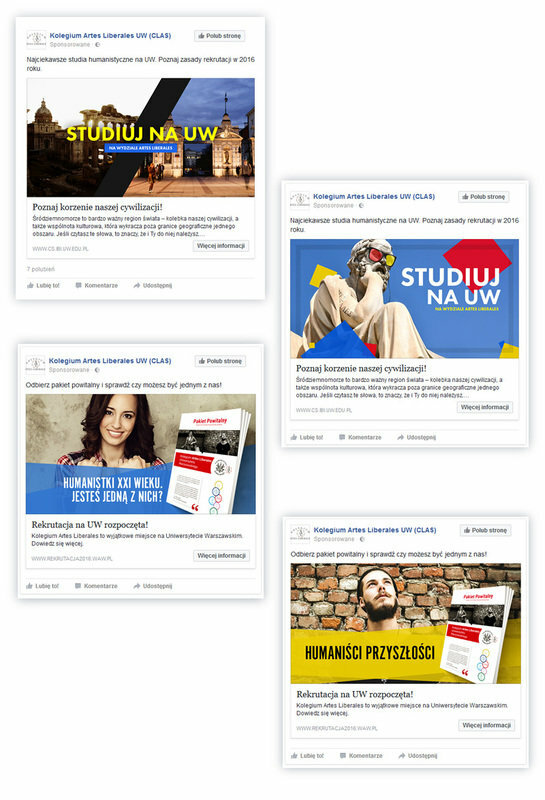 Examples of Facebook ads for the campaign. Visual communication has been adapted to the needs of young people and at the same time synchronized with the schedule of this year’s high school final exams. Traffic was directed to both landing pages from our targeted campaign on Facebook and from AdWords advertisements in Google. SEO - Top 3 in Google search for "recruitment college" phrase.